Lowest prices of Best and Less Kids' clothing range are available on this catalogue. Browse the puffa vest, hoodies, long sleeve tees, sweatshirts, jumpsuits, and more casual clothing for kids. You can safely let the kids browse and choose their own daily wear. A lot of options including peacoat & woven shirt, which costs $12, are available on the kids' outfits sale of the retailer. Easter sale covers long sleeve tees and print tees with cool designs. Buy fleece tops & bottoms for only $8 at Best and Less store. Cardigan, fashion top, and print dress are available on pg 4. 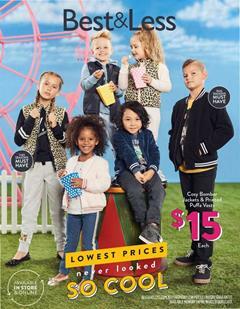 The catalogue also shows the offers of pom pom beanie, denim jacket, cuff leggings, bomber jacket for toddlers. Buy many more products and see them on the Best and Less Catalogue. Subscribe to the newsletter to get emails about the future deals.